We know you’re getting excited about Greenbelt. We guess you’re probably planning and packing ?, making lists and devising menus ?, so we’ve a few bits of information to help you get onto site quickly and safely when you arrive. be sensible – when you’re enjoying the weekend please do not leave any bags unattended and do tell a steward if you see any left lying about.
? The Festival Village opens at 4.30pm.
? Tickets will be on sale on the day at Festival Reception, but to avoid delays buy them in advance and print at home, then just exchange your e-tickets for wristbands on site.
? 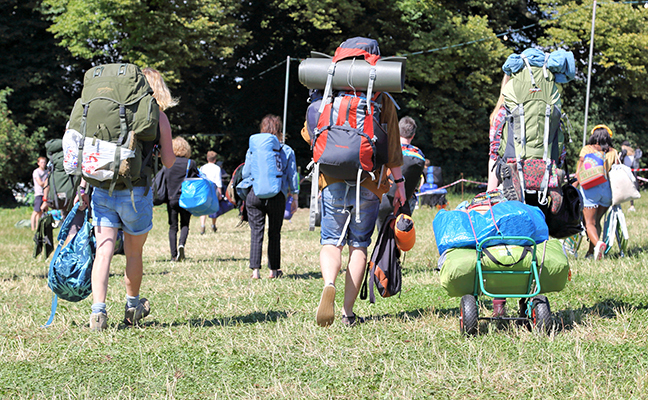 The Campsite will close at Midday on Tuesday 29 August, with taxi-buggies stopping at 11am. Please make sure you’ve packed up and cleared the site by then.
? Finally, can you do as well as last year in ensuring you Leave No Trace? You were astonishing last year. Let’s do it again.